If you’re a sports fan, and it would be safe to assume someone reading a website about baseball is, you probably don’t think about balls anywhere near as much as you should. Balls are the essential element in many sports and games and like most things that are seemingly ever-present, we take them for granted. They are always there, but how often do we actually stop and think about them? The answer to that question is probably ‘not very regularly’. The Secret History of Balls is both a colourful reminder of why we should pay them more attention and an entertaining helping hand to give balls the credit they deserve. 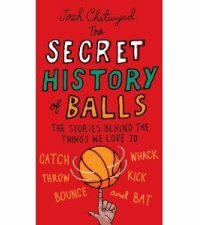 This lively guide to the history of balls is written by Josh Chetwynd. Josh is known to baseball fans in the UK as a seasoned broadcaster, formerly on Channel 5 and now BBC 5 Live Sports Extra. Throughout his career he has always shown a knack for being able to impart his knowledge and to educate while never losing sight of the fact that sport, for all the importance we typically attach to it, is first and foremost supposed to be fun. His previous two books have been masterly pieces of research on British and European baseball history. His latest, published earlier this year, takes a slightly more irreverent look at its subject matter but it still a notable collection of fact-finding in its own right. Accompanied by Emily Stackhouse’s illustrations, over sixty balls are looked at in alphabetical order, from the Australian Rules Football to the Zorb Globe (the big hamster ball for humans). The baseball section was the first that I flicked to, of course, and that’s as good an example as any in the book at the importance of the ball, in terms of its development and how this has affected the way the sport is played. As Chetwynd puts it, “when things change in baseball, the first place people look is the ball”. That comment is in relation to the so-called ‘juiced ball’ era, the late 1990s and early 2000s period of high home run totals, thought by some to be in part caused by a ‘livelier’ ball, by others to be more related to the use of steroids. Chetwynd notes the paucity of evidence there is supporting the claims that the ball was to blame, but the ‘deadball era’ undoubtedly deserves to be defined by the ball and the way it was used (and more specifically abused). Another baseball-related fact is revealed in the section on the Footbag, or Hacky Sack. This previously unknown object, to me at least, was apparently considered a symbol of friendship by the Belgium National baseball team, who gave them out to opposing players as a present. How many ballplayers responded by saying ‘umm, thanks but … I was kind of hoping for some chocolates’ is not noted. That’s one of the few nuggets of information that isn’t included; throughout the rest of the book you are constantly encountering new facts, from the technical to the bizarre. Who would think that learning about the development of the bowling ball, and the use of oil patterns on the lane to fiendishly counter the precision of modern-day balls, would be so interesting and entertaining? But it is and so are the rest of the chapters. From British staples like the cricket ball, soccer ball, rugby ball, and (‘lawn’) bowls, to pinballs, roulette balls, the Magic 8 Ball and the indispensible (and incredibly useful) ball bearing, this is a book that you will happily pluck from the shelf and flick through again and again. Have you read “The Secret History of Balls”? Feel free to share your thoughts in the comments section below. Can you recommend any other similar books? If so, let us know. Anyone who has followed Josh’s stalwart TV and radio punditry will know there are two sides to his work: (1) a rock-solid knowledge base, and (2) a more playful side. I know I’m basically repeating exactly what you said in your review, Matt, but this book sees Josh free to throw much more of the latter alongside the former. So if you liked his first two sports books, then this will not disappoint as it as rammed with facts and anecdotes as they were. Equally, if you’re more a fan of the light-hearted side of Josh’s work then this will also definitely be a book for you. Thanks for your comment, Joe, and thanks for picking up my spell-checker inspired use of the word ‘irrelevant’ when it should have been ‘irreverent’! I’ve changed that back to what it was intended.